lingWAVES has become one of the most used system for professional voice and speech analysis, biofeedback and documentation in the last years. A combination of standard and new technology analysis and processing together with an easy handling are the key features of this unique system. The system consists of different modules managed by the lingWAVES basis user interface. A client manager allows a patient/client based analysis and documentation with the benefit of comparing and tracking results over time. The modular character of lingWAVES allows to offer different module combinations (suites) so that a wide range of professional users can use the system, starting from speech and language therapy, over Otolaryngology /ENT up to services for professional singers and speakers. You can also upgrade a lingWAVES module at any time. 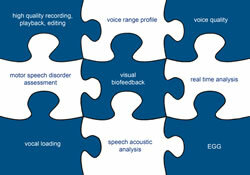 A continuous and highly productive development and maintenance is not common for speech and voice assessment tools. Exception lingWAVES: Updates are available regularly. lingWAVES is now also ready for Windows 10. Short overview about available lingWAVES modules. Click on the module name to get more information.